"Transitway" redirects here. For the network in Ottawa, see Transitway (Ottawa). For other BRT systems, see List of bus rapid transit systems. TransJakarta in Jakarta, Indonesia. With a length of 251.2 km (2019), it has the longest BRT system in the world. Bus rapid transit (BRT), also called a busway or transitway, is a bus-based public transport system designed to improve capacity and reliability relative to a conventional bus system. Typically, a BRT system includes roadways that are dedicated to buses, and gives priority to buses at intersections where buses may interact with other traffic; alongside design features to reduce delays caused by passengers boarding or leaving buses, or purchasing fares. BRT aims to combine the capacity and speed of a metro with the flexibility, lower cost and simplicity of a bus system. The first BRT system was the Rede Integrada de Transporte ('Integrated Transportation Network') in Curitiba, Brazil, which entered service in 1974. As of March 2018[update], a total of 166 cities in six continents have implemented BRT systems, accounting for 4,906 km (3,048 mi) of BRT lanes  and about 32.2 million passengers every day, of which about 19.6 million passengers ride daily in Latin America, which has the most cities with BRT systems, with 54, led by Brazil with 21 cities. The Latin American countries with the most daily ridership are Brazil (10.7M), Colombia (3.06M), and Mexico (2.5M). In the other regions, China (4.3M) and Iran (2.1M) also stand out. Currently, TransJakarta is considered as the largest BRT network in the world with approximately 251.2 kilometres (156.1 mi) of corridors connecting the Indonesian capital city. Bus rapid transit takes its name from rail rapid transit, which describes a high-capacity urban public-transit system with its own right of way, multiple-car vehicles at short headways, and longer stop spacing than traditional streetcars and buses. BRT uses buses on a wide variety of rights-of-way, including mixed traffic, dedicated lanes on surface streets, and busways separated from traffic. The expression "BRT" is mainly used in the Americas and China; in India, it is called "BRTS" (BRT System); in Europe and Indonesia, it is often called a "busway"; while in the British Isles, it may be called a "quality bus". 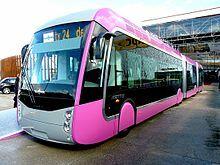 Critics have charged that the term "bus rapid transit" has sometimes been misapplied to systems that lack most or all the essential features which differentiate it from conventional bus services. The term "bus rapid transit creep" has been used to describe severely degraded levels of bus service which fall far short of the BRT Standard promoted by the Institute for Transportation and Development Policy and other organizations. The first use of a protected busway was the East Side Trolley Tunnel in Providence, Rhode Island. It was converted from trolley to bus use in 1948. However, the first BRT system in the world was the OC Transpo system in Ottawa, Canada. Introduced in 1973, the first element of its BRT system was dedicated bus lanes through the city centre, with platformed stops. The introduction of the first exclusive separate busways (termed 'Transitway') occurred in 1983. By 1996, all of the originally envisioned 31 km Transitway system was in operation; further expansions were opened in 2009, 2011, and 2014. As of 2017, the central part of the Transitway is being converted to a Light Rail Transit, due to the downtown section being operated beyond its designed capacity. The world's second BRT system, the Rede Integrada de Transporte in Curitiba, Brazil, was opened in 1974. The second BRT system in the world was the Rede Integrada de Transporte (RIT, integrated transportation network), implemented in Curitiba, Brazil, in 1974.:5 Most of the elements that have become associated with BRT were innovations first suggested by Curitiba Mayor Architect Jaime Lerner. Initially just dedicated bus lanes in the center of major arterial roads, in 1980 the Curitiba system added a feeder bus network and inter-zone connections, and in 1992 introduced off-board fare collection, enclosed stations, and platform-level boarding. Other systems made further innovations, including platooning (three buses entering and leaving bus stops and traffic signals at once) in Porto Alegre, and passing lanes and express service in São Paulo. In the United States, BRT began in 1977, with Pittsburgh's South Busway, operating on 4.3 miles (6.9 km) of exclusive lanes. Its success led to the Martin Luther King Jr. East Busway in 1983, a fuller BRT deployment including a dedicated busway of 9.1 miles (14.6 km), traffic signal preemption, and peak service headway as low as two minutes. After the opening of the West Busway, 5.1 miles (8.2 km) in length in 1990, Pittsburgh’s Busway system is today over 18.5 miles long. In 1995, Quito, Ecuador, opened trolleybus BRT. 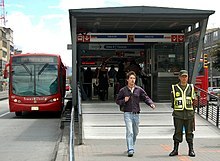 The TransMilenio in Bogotá, Colombia, opening in 2000, was the first BRT system to combine the best elements of Curitiba's BRT with other BRT advances, and achieved the highest capacity and highest speed BRT system in the world. The success of TransMilenio spurred other cities to develop high quality BRT systems. Africa's first BRT system was opened in Lagos, Nigeria, in March 2008 but is considered as a light BRT system by many people. Johannesburg’s BRT, Rea Vaya, was the first true BRT in Africa, in August 2009, carrying 16,000 daily passengers. Rea Vaya and MIO (BRT in Cali, Colombia, opened 2009) were the first two systems to combine full BRT with some services that also operated in mixed traffic, then joined the BRT trunk infrastructure. TransJakarta buses use separate lanes to avoid congested roads. Bus-only lanes make for faster travel and ensure that buses are not delayed by mixed traffic congestion. A median alignment bus-only keeps buses away from busy curb-side side conflicts, where cars and trucks are parking, standing and turning. Separate rights of way may be used such as the completely elevated Xiamen BRT. Transit malls or 'bus streets' may also be created in city centers. Prohibiting turns for traffic across the bus lane significantly reduces delays to the buses. Bus priority will often be provided at signalized intersections to reduce delays by extending the green phase or reducing the red phase in the required direction compared to the normal sequence. Prohibiting turns may be the most important measure for moving buses through intersections. High-level platforms for high-floored buses makes it difficult to have stops outside dedicated platforms, or to have conventional buses stop at high-level platforms, so these BRT stops are distinct from street-level bus stops. Similar to rail vehicles, there is a risk of a dangerous gap between bus and platform, and is even greater due to the nature of bus operations. Kassel curbs or other methods may be used to ease quick and safe alignment of the BRT vehicle with a platform. A popular compromise is low-floor buses with a low step at the door, which can allow easy boarding at low-platform stops compatible with other buses. This intermediate design may be used with some low- or medium-capacity BRT systems. High-capacity vehicles such as articulated or even bi-articulated buses may be used, typically with multiple doors for fast entry and exit. Double-decker buses or guided buses may also be used. Advanced powertrain control may be used for a smoother ride. BRT systems typically feature significant investment in enclosed stations which may incorporate attractive sliding glass doors, staffed ticket booths, information booths, and other more standard features listed above. They will often include level boarding, using either low-floor buses or higher boarding platforms level, and multiple doors to speed passenger boardings and enhance accessibility to disabled passengers. Fare validation upon entry to the station in a similar manner to that used on entry to a subway system is also common, particularly at busy stations. An example of high-quality stations include those used on TransMilenio in Bogotá since December 2000,[verification needed] the MIO in Cali since November, 2008, Metrolinea in Bucaramanga since December, 2009, Megabús in Pereira since May, 2009. This design is also used in Johannesburg's Rea Vaya. The term "station" is more flexibly applied in North America and ranges from enclosed waiting areas (Ottawa and Cleveland) to large open-sided shelters (Los Angeles and San Bernardino). Large cities usually have big bus networks. A map showing all bus lines might be incomprehensible, and cause people to wait for low-frequency buses that may not even be running at the time they are needed. By identifying the main bus lines having high-frequency service, with a special brand and separate maps, it is easier to understand the entire network. Public transit apps are more convenient than a static map, featuring services like trip planning, live arrival and departure times, up-to-date line schedules, local station maps, service alerts, and advisories that may affect one's current trip. Transit and Moovit are examples of apps that are available in many cities around the world. Some operators of bus rapid transit systems have developed their own apps, like Transmilenio. These apps even include all the schedules and live arrival times and stations for buses that feed the BRT, like the SITP (Sistema Integrado de Transporte Público or Public Transit Integrated System) in Bogotá. Since buses are usually powered by internal combustion engines, bus metros raise ventilation issues similar to those of motor vehicle tunnels. Powerful fans typically exchange air through ventilation shafts to the surface; these are usually as remote as possible from occupied areas, to minimize the effects of noise and concentrated pollution. A straightforward way to reduce air quality problems is to use internal combustion engines with lower emissions. The 2008 Euro V European emission standards set a limit on carbon monoxide from heavy-duty diesel engines of 1.5 g/kWh, one third of the 1992 Euro I standard. As a result, less forced ventilation will be required in tunnels to achieve the same air quality. A different alternative is to use electric propulsion, Seattle's Metro Bus Tunnel, and Boston's Silver Line Phase II are using this method in their BRTs. In Seattle, dual-mode (electric/diesel electric) buses manufactured by Breda were used until 2004, with the center axle driven by electric motors obtaining power from trolley wires through trolley poles in the subway, and with the rear axle driven by a conventional diesel powertrain on freeways and streets. Boston is using a similar approach, after initially using trolleybuses pending delivery of the dual-mode vehicles in 2005. In 2004, Seattle replaced its "Transit Tunnel" fleet with diesel-electric hybrid buses, which operate similarly to hybrid cars outside the tunnel and in a low-noise, low-emissions "hush mode" (in which the diesel engine operates but does not exceed idle speed) when underground. The need to provide electric power in underground environments brings the capital and maintenance costs of such routes closer to those of light rail, and raises the question of building or eventually converting to light rail. In Seattle, the downtown transit tunnel was retrofitted for conversion to a shared hybrid-bus and light-rail facility in preparation for Seattle's Central Link Light Rail line, which opened in July 2009. A BRT system can be measured by a number of factors. The BRT Standard was developed by the Institute for Transportation and Development Policy (ITDP) to score BRT corridors, producing a list of rated BRT corridors meeting the minimum definition of BRT. The highest rated systems received a "gold" ranking. The latest edition of the standard was published in 2014. The vehicle headway is the average time interval between vehicles on the same line. Buses can operate at headways of 10 seconds or less, but average headways on TransMilenio at busy intersections are 13 seconds, 14 seconds for the busiest section of the Metrobus (Istanbul). Vehicle capacity, which can range from 50 for a conventional bus up to some 200 for an articulated vehicle arranged for standing passengers. Merobus Istanbul operates both Mercedes-Benz Citaro with a capacity of 150 and Mercedes CapaCity with a capacity of 193. Based on this data, the minimum headway and maximum current vehicle capacities, the theoretical maximum throughput measured in passengers per hour per direction (PPHPD) for a single traffic lane is some 90,000 passengers per hour (250 passengers per vehicle, one vehicles every 10 seconds). In real world conditions TransMilenio holds the record, with 35,000 – 40,000 PPHPD with most other busy systems operating in the 15,000 to 25,000 range. Conventional scheduled bus services use general traffic lanes, which can be slow due to traffic congestion, and the speed of bus services is further reduced by long dwell times. In 2013, the New York City authorities noted that buses on 34th Street, which carried 33,000 bus riders a day on local and express routes, traveled at 4.5 miles per hour (7.2 km/h), only slightly faster than walking pace. Even despite the implementation of Select Bus Service (New York City's version of a bus rapid transit system), dedicated bus lanes, and traffic cameras on the 34th Street corridor, buses on the corridor were still found to travel at an average of 4.5 mph. In the 1960s, Reuben Smeed predicted that the average speed of traffic in central London would be 9 miles per hour (14 km/h) without other disincentives such as road pricing, based on the theory that this was the minimum speed that people will tolerate. When the London congestion charge was introduced in 2003, the average traffic speed was indeed 14 kilometres per hour (8.7 mph) which was the highest speed since the 1970s. By way of contrast, typical speeds of BRT systems range from 17 to 30 miles per hour (27 to 48 km/h). Kesennuma Line in Japan damaged in 2011 tsunami. JR proposed the line's conversion into a dedicated bus rapid transit (BRT) route, before the railway's full restoration. The capital costs of implementing BRT are lower than for light rail. A study by the United States Government Accountability Office from 2000 found that the average capital cost per mile for busways was $13.5 million while light rail average costs were $34.8 million. However, the total investment varies considerably due to factors such as cost of the roadway, amount of grade separation, station structures, traffic signal systems and vehicles. An ambitious light rail system runs partly underground, which gives free right-of-way and much faster traffic compared to passing the traffic signals needed in a surface level system. Underground BRT is rare and expensive. As most buses run on diesel, air quality can become a significant concern in tunnels, but the Downtown Seattle Transit Tunnel is an example of using hybrid buses, which switch to overhead electric propulsion while they are underground, eliminating diesel emissions and reducing fuel usage. An alternative is an elevated busway, which is also costly. A desire for grade separation indicates that a rail alternative may be better. Prominent articulated "tram-like" Van Hool vehicles are used in Metz, France. BRT systems have been widely promoted by non-governmental organizations such as the Shell-funded EMBARQ program, Rockefeller Foundation and Institute for Transportation and Development Policy (ITDP), whose consultant pool includes the former mayor of Bogota (Colombia), Enrique Penalosa (former president of ITDP). Unlike electric-powered trains commonly used in rapid transit and light rail systems, bus rapid transit often uses diesel- or gasoline-fueled engines. The typical bus diesel engine causes noticeable levels of air pollution, noise and vibration. 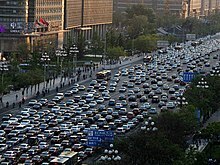 It is noted however that BRT can still provide significant environmental benefits over private cars. In addition, BRT systems can replace an inefficient conventional bus network for more efficient, faster and less polluting BRT buses. For example, Bogotá previously used 2,700 conventional buses providing transportation to 1.6 million passengers daily, while in 2013 TransMilenio transported 1.9 million passengers using only 630 BRT buses, A fleet less than a quarter in size of the old fleet, that circulates at twice the speed, with a huge reduction in air pollution. To reduce direct emissions some systems use alternative forms of traction such as electric or hybrid engines. BRT systems can use trolleybuses to lower air pollution and noise emissions such as those in Beijing and Quito. The price penalty of installing overhead lines could be offset by the environmental benefits and potential for savings from centrally generated electricity, especially in cities where electricity is less expensive than other fuel sources. Trolleybus electrical systems can be potentially reused for future light rail conversion. TransJakarta buses, uses cleaner compressed natural gas-fueled engines. While Bogotá started to use hybrid buses in 2012: they use regenerative braking to charge batteries when the bus stops and then use electric motors to propel the bus up to 40 km/h, speed at which the regular diesel engine starts automatically, with considerable savings in fuel consumption and pollutant dispersion. Furthermore, the lifetime of individual buses is generally shorter than their rail-based counterparts, potentially making the BRT system more expensive to operate in the long term. Many BRT systems suffer from overcrowding in buses and stations as well as long wait times for buses. In Santiago de Chile the average of the system is six passengers per square meter inside vehicles. Users have reported days where the buses take too long to arrive, and are usually too overcrowded to accept new passengers. As of June 2017 the system has 15% of approval from the users and has lost 27% of its passengers, who have turned mostly to cars. In Bogotá the overcrowding is even worse; the average of TransMilenio is eight passengers per square meter. Only 29% feel satisfied with the system. The data also show that 23% of the citizens agree with building more TransMilenio lines, in contrast of the 42% who consider that a rapid transit system should be built. Several cases of sexual assault have been reported by female users in TransMilenio. According to a 2012 survey made by the secretary of the woman of Bogota, 64% of women said they had been victims of sexual assault in the system. The system has even been ranked as the most dangerous transport for women. The bad quality of the system has occasioned an increment in the number of cars and motorcycles in the city, the citizens prefer these transport means over TransMilenio. According to official data the number of cars increased from approximately 666.000 in 2005 to 1.586.700 in 2016; the number of motorcycles is also growing, 660.000 were sold in Bogota in 2013, twice the number of cars sold. The lack of permanence of BRT has also been criticized, with some arguing that BRT systems can be used as an excuse to build roads that others later try to convert for use by non-BRT vehicles. Examples of this can be found in Delhi, where a BRT system was scrapped, and in Aspen, Colorado, where drivers are lobbying the government to allow mixed-use traffic in former BRT lanes as of 2017. Similarly, the Belfast Chamber of Trade and Commerce has called for bus lanes to be scrapped in certain areas of the city "as an experiment." Bangkok was also making plans to scrap a set of bus-only lanes, as of early 2017. New Orleans ran buses on Canal Street in a dedicated right of way beginning in the 1960s. This style of service was maintained until 2004 when streetcar service was restored on this 4-mile (6.4 km) route segment. This perceived lack of permanence has made BRT lines significantly less attractive to real estate developers than rail lines. Experts also attribute the failure of BRT to land use structure. Cities that are sprawled and have no mixed use have poor ridership to make BRT economically viable. In Africa, the African Urban Institute criticized the viability of ongoing BRTs across the continent. While the Los Angeles Metro Orange Line is sometimes cited as an example of a successful North American BRT line, its very success has led to overcrowding and long term plans to replace it with a rail line. The problem in replacing an existing BRT corridor with a rail line is that service disruptions are unavoidable during construction and this lack of reliability may hurt ridership. For a more comprehensive list, see List of bus rapid transit systems. ^ "What is BRT?". Institute for Transportation and Development Policy. ^ a b c EMBARQ - The WRI Center for Sustainable Transport (November 2016). "Global BRT Data — Worldwide and Key indicators per region". BRTdata.org. Retrieved 27 November 2016. ^ "Recapturing Global Leadership in Bus Rapid Transit — A Survey of Select U.S. Cities". Institute for Transportation and Development Policy. May 2011. Retrieved 3 June 2015. ^ "Bus Rapid Transit". EMBARQ. Archived from the original on 25 August 2015. Retrieved 24 February 2014. ^ "Architect of possible dreams". Congresosibrt.org. 8 May 2013. Retrieved 24 February 2014. ^ Latin American Experience With Bus Rapid Transit Gerhard Menckhoff, World Bank. August 2005. Retrieved 08-15-13. ^ Lotshaw, Stephanie (20 June 2011). "Profiles of American BRT: Pittsburgh's South Busway and East Busway". Streetsblog USA. Archived from the original on 3 February 2015. Retrieved 1 September 2015. Pittsburgh’s leadership on the urban sustainability front is not a recent phenomenon – in fact, it was the first city in the United States to implement elements of bus rapid transit, and it paved the way for more robust U.S. BRT systems. In 1977, only three years after Curitiba, Brazil implemented the world’s first BRT system, Pittsburgh opened the South Busway, 4.3 miles of exclusive bus lanes, running through previously underserved areas of the city, from the western suburbs to the downtown. The city was concerned about worsening traffic congestion, and, lacking the funds to rehabilitate the city's streetcar lines, took inspiration from Curitiba and created the South Busway. Funding for the system came from the Pennsylvania Department of Transportation, the state of Pennsylvania and Allegheny County. The Port Authority of Allegheny County, a county-owned, state-funded agency, operates the system. The success of the South Busway helped the city leverage funding for the expansion of the network, and in 1983, the Martin Luther King, Jr. East Busway opened. The East Busway began as a 6.8-mile network, with an additional 2.3 miles added in 2003, connecting the eastern suburbs with downtown. Fifteen bus routes run along its corridor. Its current weekday ridership is 25,600, with annual ridership close to 7 million. The East Busway built on the success of its predecessor and offered fundamental BRT features including a dedicated busway, service as frequent as every two minutes during peak period, signal prioritization, and direct service operations (more on that soon). However, there is no off-board fare collection. Instead, passengers pay upon entrance for in-bound trips and upon exit for outbound trips, which helps reduce delays in service because of fare collection. ^ Kaenzig, Robin; Mobereola, Dayo; Brader, Colin (4 February 2011). "Africa's First Bus Rapid Transit System". Transportation Research Record: Journal of the Transportation Research Board. 2193: 1–8. doi:10.3141/2193-01. ^ "Terminos y condiciones tarjeta MIO". mio.com.co. Retrieved 20 August 2015. ^ "Inicia Operación la Carrera 7 con Buses Duales | Transmilenio". www.transmilenio.gov.co. Archived from the original on 18 October 2015. Retrieved 20 August 2015. ^ "Tullave plus". www.tullaveplus.com. Archived from the original on 10 August 2015. Retrieved 20 August 2015. ^ "Tarjetas de TransMilenio ya se pueden recargar en todos los puntos SITP". Retrieved 20 August 2015. ^ "Historia". Transmilenio. Archived from the original on 19 September 2015. Retrieved 20 August 2015. ^ "Cali inauguró el MÍO". El País. Retrieved 20 August 2015. ^ "Arrancó inauguración de Metrolínea". Vanguardia Liberal. Retrieved 20 August 2015. ^ "Pereira se monta al Megabús". El Espectador. Retrieved 20 August 2015. ^ Characteristics of BRT for decision making. Archived 15 April 2016 at the Wayback Machine page ES-8. Federal Transit Administration (August 2004). ^ "Conozca la 'app' que le brinda información sobre Sitp y TransMilenio (in Spanish)". El Tiempo. Retrieved 6 June 2017. ^ Metro Online (14 December 2007). "Downtown Seattle Transit Tunnel and Changing Bus Technology". King County Metro. Retrieved 13 July 2010. ^ Duncan Allen (2005). "MBTA Silver Line". www.nycsubway.org. Retrieved 13 July 2010. ^ Institute for Transportation and Development Policy (ITDP) (2014). "About the Standard: What's New in 2014?". ITDP. Retrieved 22 June 2014. ^ "Applicability of Bogotá's TransMilenio BRT System to the United States" Archived 26 July 2011 at the Wayback Machine NBRTI (May 2006). Retrieved 15 March 2010. ^ "Foro TransMilenio Fase III" (PDF). Archived from the original (PDF) on 27 February 2009. ^ "Transmilenio 2013 statistics" (PDF). transmilenio.gov.co. Archived from the original (PDF) on 9 March 2014. Retrieved 8 March 2014. ^ a b "Ahmedabad bus users down 25% in a decade! - Times of India". The Times of India. Retrieved 6 March 2019. ^ "International Public Transport Conference 2010 – Case Study of the Guangzhou BRT". Archived from the original on 13 July 2011. Retrieved 5 August 2010. ^ "BRT Data Latin America / Brazil / Curitiba". Retrieved 24 August 2014. ^ "Intermodal Connectivity to BRT: A Comparative Analysis of Bogotá and Curitiba" (PDF). Journal of Public Transportation. Retrieved 24 March 2014. ^ a b "Characteristics of BRT for decision making" (PDF). Federal Transit Administration. 1 August 2004. Archived from the original (PDF) on 15 April 2016. Retrieved 8 February 2016. Exhibit 3-22: "Maximum observed peak hour bus flows, capacities, and passenger flows at peak load points on transitways"
^ W. Hook, S. Lotshaw and A. Weinstock (2013). "More Development For Your Transit Dollar. An Analysis of 21 North American Transit Corridors" (PDF). Institute for Transportation and Development Policy. p. 20. ^ W. Hook, S. Lotshaw and A. Weinstock (2013). "More Development For Your Transit Dollar. An Analysis of 21 North American Transit Corridors" (PDF). Institute for Transportation and Development Policy. p. 21. ^ "34th Street Select Bus Service". Bus service along 34th Street is among the slowest in the city. Buses travel at an average of 4.5 miles per hour (7.2 km/h), only slightly faster than walking. Despite these slow speeds, 34th Street is a major east-west bus corridor, carrying over 33,000 bus riders a day on local and express routes. ^ "Impacts monitoring — fifty annual report" (PDF). Transport for London. ^ "Characteristics of BRT for decision making" (PDF). Federal Transit Administration. 1 August 2004. p. ES-5. Archived from the original (PDF) on 15 April 2016. Retrieved 8 February 2016. ^ a b GAO (September 2001). "Bus Rapid Transit Shows Promise" (PDF). GAO. Retrieved 16 March 2011. ^ Ross, Benjamin. "Big Philanthropy Takes the Bus". Dissent. Dissent. Retrieved 30 November 2016. ^ "Peñalosa y su trancón de intereses". Al Garete (in Spanish). 24 January 2016. Archived from the original on 1 May 2016. ^ "Si Peñalosa no va a la ciudad, la ciudad va a Peñalosa". Al Garete (in Spanish). 7 March 2016. Archived from the original on 6 May 2016. ^ "Historia". Alcaldía de Bogotá – Transmilenio. Archived from the original on 19 September 2015. Retrieved 20 August 2015. ^ "Informe de gestión de Transmilenio 2013 – page 18" (PDF). Transmilenio, Alcaldía de Bogotá. Archived from the original (PDF) on 18 October 2015. Retrieved 20 August 2015. ^ "Edmonton Trolley Coalition". trolleycoalition.org. ^ "Inicio de operación de buses híbridos". Alcaldía de Bogotá – Transmilenio. Archived from the original on 18 October 2015. ^ "El pecado original que determinó el fracaso del Transantiago". Diario UChile. 10 February 2017. ^ "10 años de Transantiago: su deterioro y su reemplazo". Algarete (in spanish). 30 June 2017. ^ "¿Por qué colapsó TransMilenio?". Revista Semana. 3 August 2014. ^ "El futuro de Transmilenio". Bogota como vamos. 28 August 2014. ^ "Preocupantes cifras de acoso a mujeres en Transmilenio". noticias RCN. 21 August 2013. ^ "EXCLUSIVE-POLL: Latin American cities have most dangerous transport for women, NYC best". Thomas Reuters Foundation News. 29 October 2014. ^ "Los 10 problemas más graves de Bogotá". Deustche Welle. 17 October 2016. ^ "Transjakarta : Otro caso de "éxito"". algarete (in spanish). 25 February 2016. ^ "Another Alleged Sexual Harassment at TransJakarta Station". Jakarta Globe. 5 December 2012. ^ "Jakarta governor apoligezes for less than optimal Transjakarta busway services". Global indonesian voices. 13 March 2015. ^ "Delhi's BRT Corridor to be demolished!". News Mobile. 18 January 2016. ^ "Bloqueo TransMilenio". El Tiempo (in Spanish). ^ Lalchandani, Neha. "BRT will be scrapped, decides Arvind Kejriwal". The Times of India. Retrieved 23 May 2017. ^ Carroll, Rick. "Aspen candidates mull citizen's proposal to open bus lanes to all vehicles". The Aspen Times. Retrieved 23 May 2017. ^ "Trade body in 'scrap bus lanes' call". BBC News. Retrieved 23 May 2017. ^ PBS, Thai. "BRT bus service to stop end of April". Pattaya Mail. Archived from the original on 8 February 2017. Retrieved 23 May 2017. ^ "New Orleans Public Service Inc. (NOPSI) Flxible New Look Buses 168-195 & 314-409 @ streetcarmike.com". streetcarmike.com. ^ Suzuki, Hiroaki; Cervero, Robert. "Transforming Cities with Transit: Transit and Land-Use Integration for Sustainable Urban Development" (PDF). The World Bank. ^ Venter, Christo. "South Africa needs to revamp its new public transport system". The Conversation. Retrieved 7 September 2018. ^ "Bus Rapid Transit system on road to nowhere in Gauteng". Retrieved 7 September 2018. ^ Muzenda, Archimedes. "Is Harare ready for Bus Rapid Transit System?". African Urban Institute. Archived from the original on 7 September 2018. ^ Bel, Germà; Holst, Maximilian (1 April 2018). "Evaluation of the impact of Bus Rapid Transit on air pollution in Mexico City". Transport Policy. 63: 209–220. doi:10.1016/j.tranpol.2018.01.001. ISSN 0967-070X. Wikimedia Commons has media related to Bus rapid transit. Cervero, Robert (2013). "Bus Rapid Transit: An Efficient and Competitive Mode of Public Transport" (PDF). European Automobile Manufacturers Association. "Characteristics of Bus Rapid Transit". National Bus Rapid Transit Association. 2009. Archived from the original on 18 February 2010. Retrieved 3 March 2010. Levinson, Herbert S. (2002). "Bus Rapid Transit: An Overview" (PDF). Journal of Public Transportation. 5 (2): 1–30. doi:10.5038/2375-0901.5.2.1. Wang Fengwu and James Wang (April 2004). "BRT in China" (PDF). Public Transport International. Retrieved 10 March 2010. Vincent, William; Lisa Callaghan Jerram (April 2008). "Bus Rapid Transit and Transit Oriented Development: Case Studies on Transit Oriented Development Around Bus Rapid Transit Systems in North America and Australia" (PDF). Washington, DC: Breakthrough Technologies Institute.